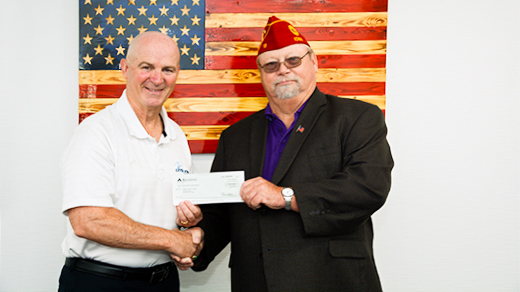 Past American Legion of Iowa and West Union American Legion Post 15 commander Dennis Soppe (right) presented a check on Thursday, September 6, in the amount of $2,000 to Upper Iowa University President William R. Duffy. Upper Iowa applied for and received the funding from the American Legion of Iowa Foundation, which will support two $1,000 scholarships for Iowa residents who are veterans, or spouses or dependent children of a veteran. The scholarships will be presented during the 2019 UIU Honors & Awards Banquet in April.